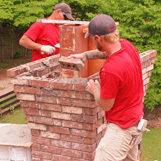 Homeowners in Marietta GA and across all of Cobb County, including Kennesaw, Fair Oaks, Smyrna, Mableton, and more have continuously turned to Chimney Solutions as their chimney contractor of choice for nearly two decades. Local residents have come to recognize the professional workmanship and friendly faces of our chimney sweep technicians. 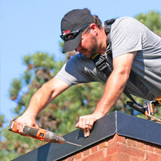 Chimney Solutions has been proudly serving the greater Atlanta area and providing top notch chimney sweep services for nearly two decades. We always maintain the highest standards of quality and consistently deliver exceptional customer service for every homeowner we serve. 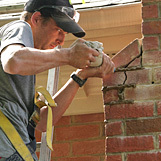 Since 1998, customers in Marietta GA have turned to us year after year for their annual chimney cleanings & inspections. Every job completed by us is performed by a CSIA certified chimney technician and our qualified contractors always show up on time, in full company uniform, and in a clearly marked company vehicle. Our CSIA trained & certified chimney sweeps provide chimney sweep services like chimney cleaning, chimney repair, chimney liner installation, chimney cap replacement, chimney chase top installation, firebox rebuilding, and more for the residents of Marietta GA and the surrounding communities. You can’t miss our distinctive company trucks travelling on Interstate 75, up and down Rt 41 & Kennesaw Ave, and across Whitlock Ave and the Marietta Parkway. 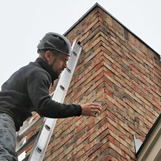 On their way to service chimneys, fireplaces, and heating stoves, our chimney professionals provide a full range of chimney maintenance and repair services, including historic chimney restorations, chimney masonry repairs, tuckpointing, chimney waterproofing, and more. We strive to remain the chimney sweep provider of choice for Marietta GA and the greater Atlanta area. We will always stand behind every job we complete and we want to ensure that every client is 100% satisfied with the work done. Homeowners can count on us for a quick response, fair estimate, and a full explanation of any recommended services. As good standing members of the National Chimney Sweep Guild and the Chimney Safety Institute of America, we remain current with the industry’s best practices, new standards & regulations, and proper service techniques to ensure that we deliver the best service possible. Customers across the area know they can trust us with all of their chimney & venting needs which is why we receive huge amounts of word-of-mouth referrals. Buyer Beware! Don’t fall for this common chimney sweep scam! 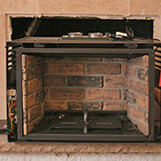 There are unscrupulous “chimney contractors” in the industry that are out to fool unsuspecting homeowners. These “cheap sweep” companies, as they are called, advertise ridiculously low prices for common chimney sweep services like an inspection or chimney cleaning. They entice homeowners with these low prices in order to score the job, but it’s important to remember that you get what you pay for, especially in these circumstances. 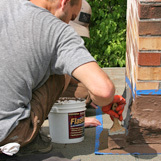 These contractors are neither trained nor qualified to complete work on complicated chimney systems, and many will perform a quick, shoddy job just so they can get on to the next appointment. Many times, these cheap sweeps know that the homeowner is unaware of the current condition of their chimney system so they will attempt to scare the homeowner into thinking that there is serious & extensive damage to the chimney that must be repair immediately. Never agree to any expensive chimney repairs without getting a second opinion first! Don’t pay more than you have to in order to fix your chimney and don’t let the safety of your home & family rest in the hands of untrained chimney sweeps. Marietta GA Chimney Sweeps provide chimney cleanings, chimney inspections, chimney repairs, annual chimney maintenance, and more. Trust the Pros at Chimney Solutions for all of your chimney and venting needs, including service for your fireplace, stove, fireplace insert, furnace & venting systems. Jan 04, 2017 by Jonathan S.